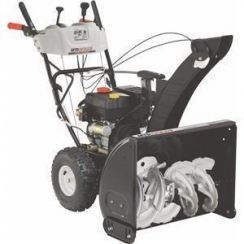 357CC Gold Series Snow Thrower. 357CC 4-cycle OHV MTD engine. Two stage. 28" clearing width, 21" intake. Push button electric start. Single hand operation. Clutch lock system allows operator to adjust snow discharge direction while in full operation. Heated hand grips. Large 12" impeller throws snow further. Dash mounted single lever extended 4-way chute and pitch control. Serrated augers. 16" x 4.8" Snow Hog tires. Light kit molded in control panel. Rugged polymer chute with 180 degree rotation. Chute cleaning tool included. 6 forward speeds - 2 reverse with "clutch lock". Deluxe adjustable skid shoes. 1.25 gallon fuel capacity. Oil included.